My latest discovery brought me to the beautiful village of Llandaff, Cardiff. Known for its iconic cathedral, it truly is a picturesque location, just north of Cardiff. 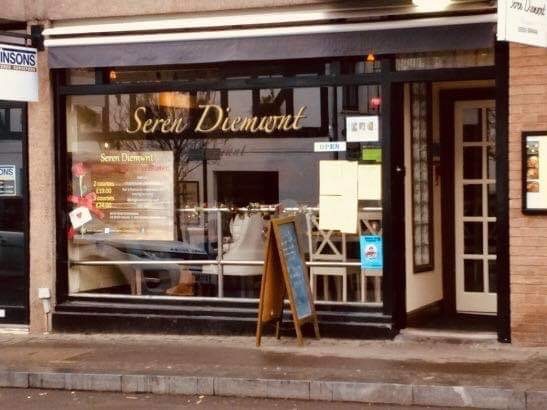 Seren Diemwnt is set on High St, which is a prime spot in Llandaff. The head chef and owner Gethin Rees has worked in hospitality since he was 17 and has a unique flare for creating hearty inspiring dishes. The restaurant name translates to diamond star in English which has a very personal connection to Mr Rees. This name refers to someone he lost at a very young age. He envisaged the restaurant would be a sign of lasting respect to that person. I chose the pork belly starter which was accompanied with a spinach Velouté, which really complimented the dish. It was garnished with a coral tuile which added even more interest to the dish. For my main course I chose the parsley crumbed lamp rump; this was paired with crispy kale, dauphinoise potatoes, parsnip purée and a red wine jus. The lamb was served perfectly pink and was incredibly succulent. The dauphinoise potatoes were expertly cooked and had subtle hints of garlic, which tasted superb. The accompanying red wine jus was a perfect addition to this dish. My guest opted for the pan seared goose breast which was accompanied with a chestnut purée, creamy mash purée and a pungent passion fruit and whisky sauce. The goose breast was served pink and was a sheer delight. I have to applaud Mr Rees’s offerings, as we both found them to be sensational. The internal space was very inviting and had an intimate charm to it. The contemporary lighting, use of wood and metal all add to the calming ambience. The waiter was very attentive and knowledgeable, which is key to making sure the whole customer experience is an enjoyable one. It was a cold winters evening, so moving into such an intimate and inviting space was really pleasant. I would recommend this restaurant to anyone looking for something of superior quality and excellent value for money. The menu offered a wide variety of locally sourced dishes that would appeal to the most finical of diners.